Enter the world of precision thin-cutting. From now on, even more customers will benefit from the tried and tested technology of the world market leader in precision thin-cutting: adapted to fit your requirments exactly, the machine offers an unbeatable price-performance ratio. The DSB Compact 310 is the entry model in the thin-cutting band saw product family and cuts with a kerf starting at 1.1 mm. With a cutting height of up to 160 mm and infinitely variable control of the feeding speed from 1 to 16 m/min, the thin-cutting band saw can handle wooden blocks up to a width of 310 mm. How to exceed high expectations? By being able to offer benefits as standard. Flexible and sturdy wooden block transportation. The innovative conveyor belt feed system on a solid-cast substructure guarantees the customary precision of WINTERSTEIGER thin-cutting band saws. Depending on the kind of wood and the preparation and dimensions of the block, the sturdy block transportation continually feeds the blocks with a speed of 1 to 16 m/min and achieves a cutting precision of up to 0.2Â mm in the process. Integrated continuous cleaning system. In order to guarantee a consistently high cut precision with a feed system, the transport surface must be kept free of saw dust at all times. To achieve this, WINTERSTEIGER developed its own conveyor belt and an integrated continuous belt cleaning system that guarantees high precision for both wet and dry cutting applications. Smooth saw blade entry for better cutting performance. The smooth saw blade entry system goes easy on the saw and improves the quality of the output. Thanks to the reduced speed at entry of the sawblade into the wooden block, the forces working on the saw are minimized: the deflection of the blade is reduced. Once the blade is completely submerged in the wooden block, the speed of the feed is increased again. High-tech carbon pressure guide system. This high-tech composite material made of abrasion-proof carbon fibers and heat-resistant epoxy resin guarantees precise blade guiding and an extremely long lifetime. Great comfort of operation. The DSB Compact 310 is impressively easy to use. The touch screen display and the easy-to-understand menus guide the operator through the program. It also features a multilingual user interface as well as numerous service and help menus. The comprehensive portfolio of machines and tools developed and produced by WINTERSTEIGER guarantees the long-term performance of every single WINTERSTEIGER machine. Ergonomic and easy to maintain. The DSB Compact 310 also offers maximum comfort for maintenance. All service-related components of the in-feed and out-feed side are fully accessible so that the time and costs for machine set-up, making adjustments and changing saw blades are all reduced to a minimum. The enclosed saw unit within the machine makes it much easier for the sawdust to be transported out of the machine. The advantage: minimal need for cleaning. We make you a clear offer. And still leave you the freedom to choose. The quality of an offer lies not only in its clearly redeemable value promise. Its quality also increases with the opportunity to choose, for example, between options which further improve the result depending on individual needs. Innovative spraying system for wet cutting. Spraying the saw teeth with a special, highly wood-compatible spraying agent creates a vapor that lubricates and cools the saw blades. The spraying intervals can be customized according to need and application. 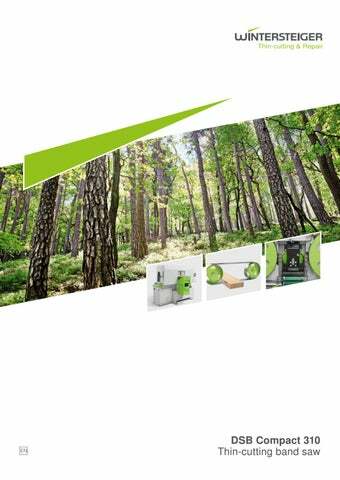 The benefits: improved lifetime of the thin-kerf saw blades thanks to reduced friction and the prevention of resin build-up. The benefits of the spraying system are particularly evident when cutting wet wood. But it also demonstrates its performance in applications involving wood species with a high resin or silicate content. Optional spraying with water. As an alternative to conventional spraying agents, water is also well-suited for the processing of certain kinds of wet wood. A small amount is sprayed on the tips of the teeth and loosens the mass of wet sawdust, resin and lubricant. The lateral clearance angles of the saw therefore remain clean and functional. Water as a spraying agent can be combined with conventional agents or employed separately as needed. Roller table extensions for optimal block support. A sturdy support for blocks at the machine's in-feed and out-feed ensures precise cutting. WINTERÂ­ STEIGER has developed a robust, 1.3 m long roll-table extension for this purpose. Modular flexibility. The construction of the DSB Compact 310 makes it possible to easily position multiple machines in-line. The customer remains flexible: with increasing demand of capacity, additional machines can be added in-line. Quick help. Quality and speed are the deciding factors in the event of a breakdown. WINTERSTEIGER sales and service networks guarantee optimum support in case of technical queries and fastest possible support by professional service technicians. To improve availability and reduce response times even more, you also have the option of equipping your WINTERSTEIGER thin-cutting band saws with remote service. You are always only seconds away from a professional problem analysis with the WINTERSTEIGER Remote Service. Your machine's online connection is the direct link to our technical customer service. Error detection and diagnosis are done in real time, as well as data analyses, optimizations and service measures. 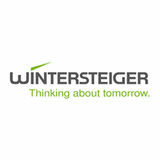 The WINTERSTEIGER Remote Service works with LAN/WAN/GPRS/UMTS/HSDPA. Representations: Albania, Bosnia Herzegovina,Croatia, Finland, Japan, Korea, Kosovo, Macedonia, Montenegro, Poland, Portugal, Serbia, Slovenia, Spain, Sweden, Taiwan, Turkey. Contact details for our representatives are available on www.wintersteiger.com/woodtech. 78-730-251 DSB Compact 310 05/2017. Fotos: Resch, WINTERSTEIGER. Copyright © 2017 WINTERSTEIGER AG, artindustrial und partner GmbH. Success starts with the right decision. At the right time. We look forward to you!